March 26th, 2018, Charlottetown – A pair of Island speed skaters came up big in their last competition of the season, in Calgary, Alberta, recently. Peter McQuaid and Jenna Larter were competing in the Canadian Junior Selections #2 competition with the country’s top junior speed skaters and both came away with new provincial records and finishes well above their pre-event seedings. Peter McQuaid set three new P.E.I. provincial records for Intermediate Men in Calgary recently. Photo courtesy of Kristen Binns. McQuaid nabbed new P.E.I. records for Intermediate men in all three distances he skated, breaking a pair of records held by Scott Beamish since 2010 in the 500 metre and 1500m distances, with times of 43.671 seconds in the 500m and 2:21.795 in his 1500m. McQuaid advanced all the way to the B Final in the 1500m, finishing thirteenth in the distance, among the 59 skater male field. The Charlottetown native also tallied a new P.E.I. record in his 1000m distance, shaving time from his own provincial mark. McQuaid’s 500 metre record time makes him the second fastest Islander of all time in the distance on the short track. All three of his record times were the fastest ever recorded by an Islander while training on P.E.I.. McQuaid finished 28th overall at the four-day event, well above his original seed position of 48th. Larter had a similarly successful competition, finishing 22nd in the 42 skater female field, while also smashing the P.E.I. Junior women’s record in the 500m distance. The Brookfield skater recorded a time of 47.446 seconds in the distance, taking a whopping two seconds off the record time set by Carly Connell in 2014. 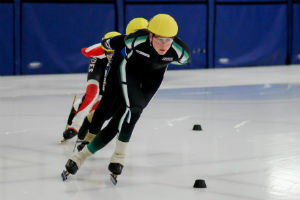 Larter, who was skating in the national junior event for the first time, earned fifteenth place in the 500 metre distance. After a tough first day of competition, Larter made a strong recovery, earning 24th and 25th place finishes in the 1500m and 1000m distances, respectively. The Speed Skate P.E.I. member entered the competition seeded 31st. At fifteen years old, Larter now owns the third fastest short track times for an Island female at any age, trailing only Jenna Gallant and Carly Connell. P.E.I. coach Sarah Taylor said she was more than pleased with the performances. “When your athletes come up with their best performances in their biggest competitions, you can’t help but be very happy for them. Peter and Jenna have worked hard this year and these results should really build their confidence. At the same time, we know that our competition is also getting stronger and a big summer of training is going to be key for our whole team as we look ahead to next year’s Canada Winter Games,” said Taylor. For full results and more information on Speed Skate PEI, visit www.speedskatepei.ca.